Oberlin Conservatory and F.Lorée in Paris collaborate on a day of oboe events on campus. 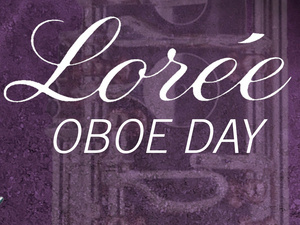 The day features a Q&A with Lorée president Alain de Gourdon, recital, master class, reed class, instrument exhibit, and welcomes several of the world's top oboists. Master artists include San Francisco Symphony Principal Oboe Eugene Izotov, Cleveland Orchestra Principal Oboe Frank Rosenwein, and Solo English Horn of The Cleveland Orchestra Robert Walters. Hosted by Oberlin Oboe Professor Robert Walters. Instument specialist Carlos Coelho will be on hand for adjustments, small repairs, and to share the F.Lorée line of instruments. Ask questions and learn about this line of instruments from the F.Lorée President Alain de Gourdon. Featuring Cleveland Orchestra English Horn Robert Walters, Cleveland Orchestra Principal Oboe Frank Rosenwein, Chicago Symphony Orchestra Principal Oboe William Welter AD ’18, and Cleveland Orchestra Second Oboe Corbin Stair.